This should be interesting, I was working on a post about the sinking of the Empire Knight and just peeked at the Hassler on AIS She is indeed working the wreck! They are having a busy weekend. I had wondered about this wreck of late. Seacoast online publishes a great deal of Maine news. A few months ago we had a story about elevated mercury in lobsters and the shutdown of a lobster fishery in Maine. So when I saw the Hassler doing sand surveys yesterday I was going to call the Hassler team to suggest going North to make some news. 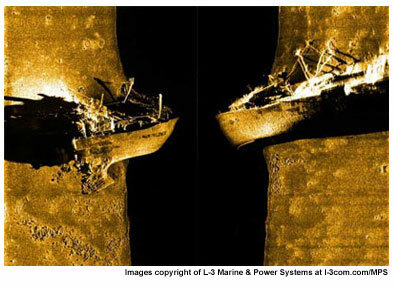 NOAA made international headlines this week when they released a side scan sonar photo of a wreck in San Francisco Bay. The wreck was located last year just inside the Golden Gate . I really was not that impressed with the image of the City Of Chester ,but it sank in 1888 in a tragic accident with 16 lost. I almost purchased a new toy for the boat this season a new sonar from Raymarine called the Dragonfly, but the size of the transducer threw me a bit. It still may happen but I can wait. This Dragonfly can image wrecks at significant depth. Maybe try and “see” the locomotive on the bottom of Portsmouth Harbor, or go try and image the Empire Knight. In 1990 the US Coast Guard got hold of the manifest of the Empire Knight a British Merchant ship that wrecked and discovered it was carrying a load of casks containing mercury. The area of the wreck is off limits to fisherman and divers. An inspection found that many casks had deteriorated and the mercury gone. 24 British sailors drowned on February 11, 1944 when the Empire Knight hit a ledge near Boone Island. It was bound for New York City. There was a treasure hunter that once proposed salvaging the mercury and some spools of wire. The plan was not approved due to unstable nature of the casks. There is approximately 16,000 lbs of mercury still located in the stern holds of the vessel. 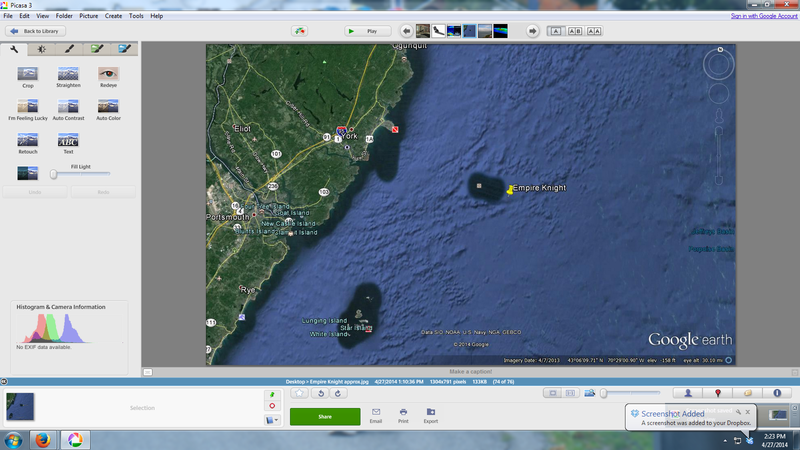 It’s deep, lying at 260ft here is a sonar image taken by a NH firm. I hope the Hassler can release their images soon from the survey which is underway as I type this post. On L-3’s web site this undated scan was labeled as a training exercise with a new towed device. There does not appear to me to be significant sediments covering the wreck. 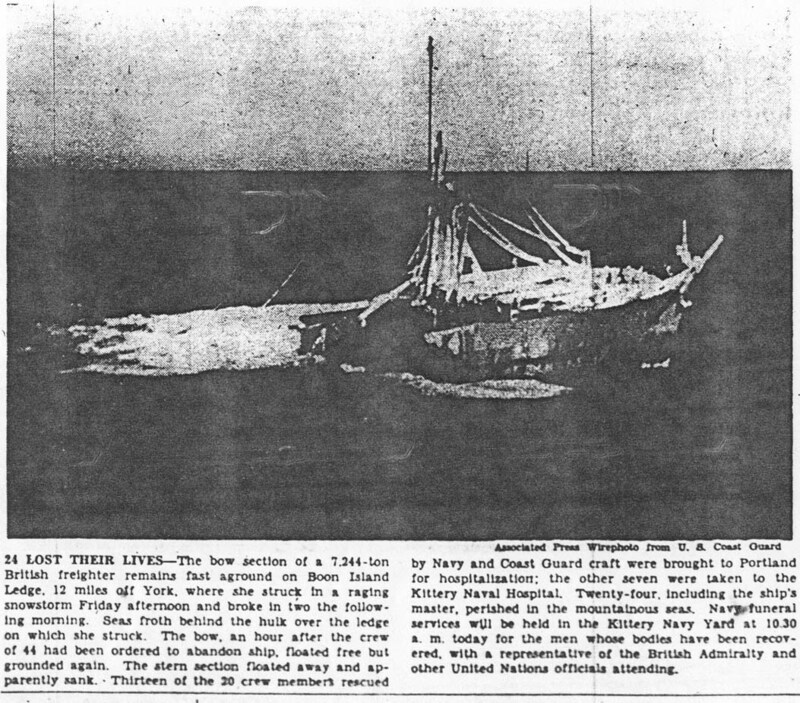 This was a hope of those that examined the wreck in 1990. The stern of the Empire Knight is I think, hanging off a ledge. Honestly, I hope the Hassler does a complete survey so one can better understand the position of the ship. If you are interested in reading more material I have the empire_knight(3) NOAA Risk Assessment. The document goes into great detail. 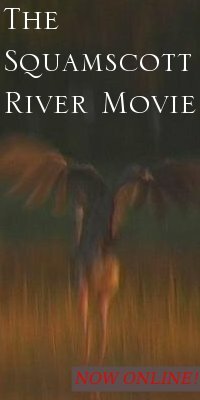 I have a lobster maybe two times a Summer, and it’s usually coupled with a trip by boat to Chauncey Creek. The Maine problem with elevated mercury in lobsters (in a specific area) is caused by a land based plume from an abandoned manufacturing site. I read this week that the Maine lobster fishery may be going into a slide, due to natural fluctuations. “It was bound to happen ” one fellow said “after so many years of bounty” . The lobster has a long cycle. I am glad the Ferdinand Hassler is scanning the wreck, it seems to me a prudent use of sailing time .